I was lucky enough to attend a Jing Tea Masterclass, which was held at the Spice Market Restaurant at the fabulous W Hotel in the heart of Leicester Square. This was the perfect venue for this masterclass. I had not been much of a tea drinker as I am a coffee addict and my only experience with tea was Indian Masala Chai or black tea from Kenya, where I was born. I was intrigued to try the different teas Jing had on offer for this masterclass. As we waited we were given refreshing chilled white tea infused with Jasmine and peach. We were seated on tables of 6-8 people with a representative from Jing taking us through the different types of tea. We started the masterclass with the Jing Silver Needle White Tea, which had hints of cucumber and melon. This would taste great with honey, peach, cucumber, melon and light, fruity desserts. We then moved on to green tea. My experience of green tea is not the best but I soon realised that there are different types of green tea. This one was Jing Hui Ming Spring Green Tea. It tasted creamy, floral and smooth. It had taste notes of orchids and sweet pea. Could just imagine beautiful orchids blooming. This is from the Zhejinag Province in China. It would taste great with sea food, fresh vegetables and almonds in particular. We then moved on to black tea. We tried the Jing Golden Gong Fu Black Tea which was fresh and fruity with aromas of lily, plum and caramel. This would taste great with red meat, fresh basil and shortbread. We then took a break for canapés provided by the lovely Spice Market restaurant. Sushi rolls and skewers and spoons of yumminess awaited us on tables. We were even spoilt with ice cream! With our tummies satisfied we reconvened for the highlight of the evening – Matcha making and pairing. Whisks, bowls and lovely green matcha powder had been laid out in front of us along with cubes of amazing white chocolate. We used the Jing Matcha Green Tea, which was grassy and fresh. It had an initial bitter taste which quickly lead to a lovely, lingering sweetness. This tea is from Kagoshima in Japan. We paired it with white chocolate, which it complemented perfectly. We were shown how to whisk the tea and then had a taster. It was lovely and a tea I would definitely have again and incorporate into desserts as well. I learned important tips about making tea during this masterclass which I thought I would share with you. The temperature of the water is very important. I used to just boil my kettle and pour boiling hot water into my mug. For white tea and green tea this actually burns the tea and alters the taste of the tea. The right temperature is 80 degrees celsius. The trick is to pour a little cold water in the mug first and then the boiling water to achieve that temperature. The correct infusing time is 3 minutes. The longer you keep it in the stronger the taste gets. If you want chilled tea, pour room temperature water over the tea leaves and infuse in the fridge for a few hours. This is so refreshing! 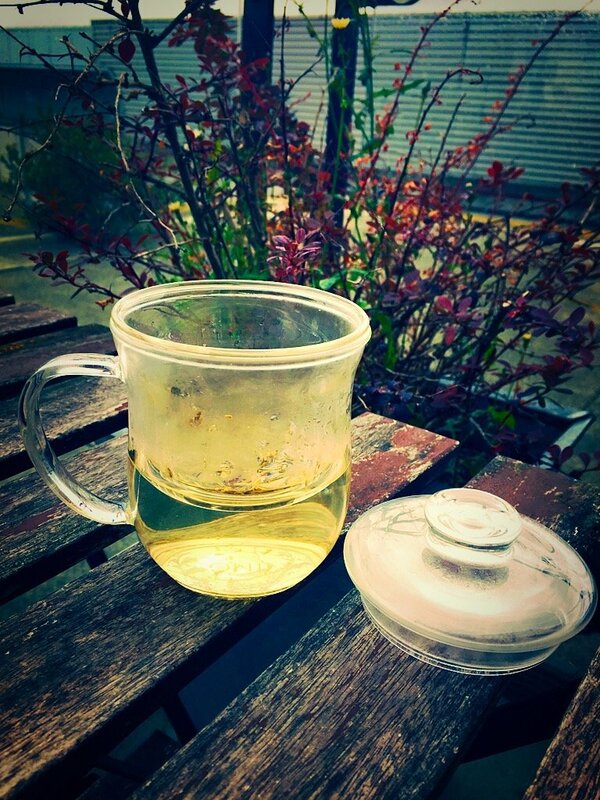 If you want to try Jing tea, this month there is a 10% discount for my readers. Use the code GTGAUG15 for a discount during August. I would recommend getting a tea infuser mug for the perfect cup of tea too. Mine is pictured below. Hope you try it and if you do would be interested to know what you think! Do try out the Spice Market restaurant too at the W hotel, London.